This witty & creative photos collection proves that a little imagination is the “Key” to a good picture. Photographer Stanislav Aristov literally taking that “Key” to new heights. 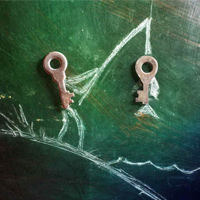 He re-creates everyday scenes & objects using a collection of keys and a chalk strip. After acquiring a large selection of keys from friends and family as well as local charity shops, Stanislav then went about scrawling anything from a key shaped rain drops to a key-eyed crab”. While we are on the “Keys” topic, I like to share a beautiful quote here by Bill Cosby.